Close to the main prkwy in Pigeon Forge, Call now! Save 20% on your March vacation! Come stay with us! 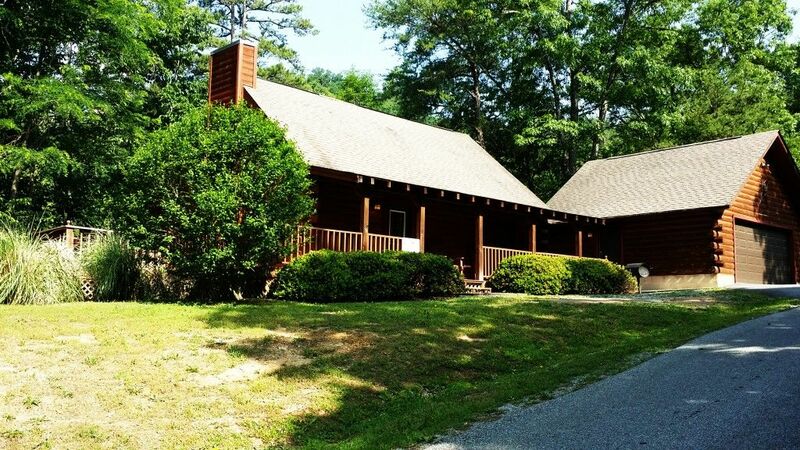 Heaven's Gate is a beautiful 2 bedroom true log cabin close to everything but far enough away to avoid the noise. Located between Pigeon Forge & Gatlinburg just a few miles from the main parkway in Pigeon Forge & about 10 minutes to Gatlinburg. The attractions, shopping & restaurants are just a few minutes away. CALL US FOR AVAILABILITY or visit our website at www.hemlockhillscabinrentals.com for other cabins & our rental agreement. We will most likely have something available for you. Sleeps 8 people but very affordable. It has 1 bedroom with a queen bed & 1 bedroom with a King bed plus a set of twin size bunk beds. Also a sofa sleeper in the living room. Great for families! Enjoy your meals on the deck sitting in the rocking chairs or at the patio table. There is a charcoal grill & a fully equipped kitchen to make preparation easy. Then relax in the hot tub as you enjoy the view. Or play a game of pool or air hockey before you turn in for the night. Quaint little cabin not too far from town but secluded enough for a little privacy and nice getaway. Stayed there the weekend of all the rain and was VERY impressed when someone from the company stopped by to check on all the visitors in their properties due to the local flooding, and let us know about the end of the road being temporarily flooded (note I do not think it floods all the time, it was merely a crazy amount of rainfall all across TN). Truly a company that cares about people and not just money! On top of that the view was great, the cabin cozy, and the hot tub + those views, just wow. We absolutely loved this cabin. We had lots of room to move around. My Junior in high school & my sophomore in college loved the pool table. It was a home away from home! The stay was fine. We don't spend much time in our cabins, but when we do we like to be able to enjoy it. This place hasn't had a deep cleaning in a long time. Fans are caked in dust. My daughter has a rash, hopefully not bed bugs. Front door handle doesn't work properly. There's a garage, but no way to get into it to use it. One of the showers don't function at all. Windows were unlocked and didn't notice until days into our stay. This place doesn't feel clean at all. My wife wouldn't walk around without her shoes on. I've stayed in many cabins in Gatlinburg and pigeon forge and definitely my worst experience. I do not recommend. Thank you for your review. I apologize you had this experience! We are a small faith based family business and strive to take the best care of our properties. The cleaner that was servicing this property is no longer with us due to this being an issue on their list of properties to service. Again, I apologize for this and would love to have you stay with us again in the future so we can make this right. Please let me know if you have any questions or additional concerns. We loved our stay in the “Heavens Gate” cabin. The cabin is well maintained and only had a few very minor issues. The scenery is soothing and serene, we even seen a momma bear and cubs. The Gatlinburg and Pigeon Forge area have many, many actives for all ages of the family! Everything from outlet shopping, dinner shows, go carts, mini-golf, or Cades Cove motor trail located in the Great Smoky Mountains National Park! I recommending visiting the Dixie Stampede or Dollywood and Dollywood Splash country! We get discounted tickets so please be sure to mention if you are interested in visiting these attractions!